The Mountain Bike that Could.. I had an evening that gave me a lot of joy and happiness and… relief. I made a collage (see below) with the pics I took (naturally — I love pictures!). As some of you know, I have not been able to cycle for about a year, besides the ADA Tour de Cure last month, which I made an exception for, because of my severe frozen shoulder. While on that ride, my shoulder & arm started hurting at mile five and continued hurting for a few weeks which has not left me inspired to hop on my bike again. Well today was day five with no walk due to some foot pain I have been experiencing. 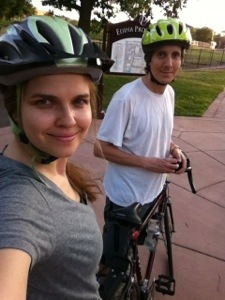 Feeling crabby and just not well from lack of movement for so many days, I set out for a bike ride tonight with Jaim. Thank goodness he was willing to ride with me as I really needed his support and I HIGHLY doubt I would have gotten out on a ride tonight myself without his companionship, support and presence. I am working on an article to publish that will have the latest update on my foot. 2. The mountain bike and a close-up of the nifty shock absorber that padded my shoulder from the bumps! 3. The adorable little puppy we met tonight on our ride! I did stop my bike ride just to go over and meet her. Her name is Gladys and she is just 10 weeks old and a “Boxador.” (Lab/Boxer mix!). 4. BG on ride – 81. 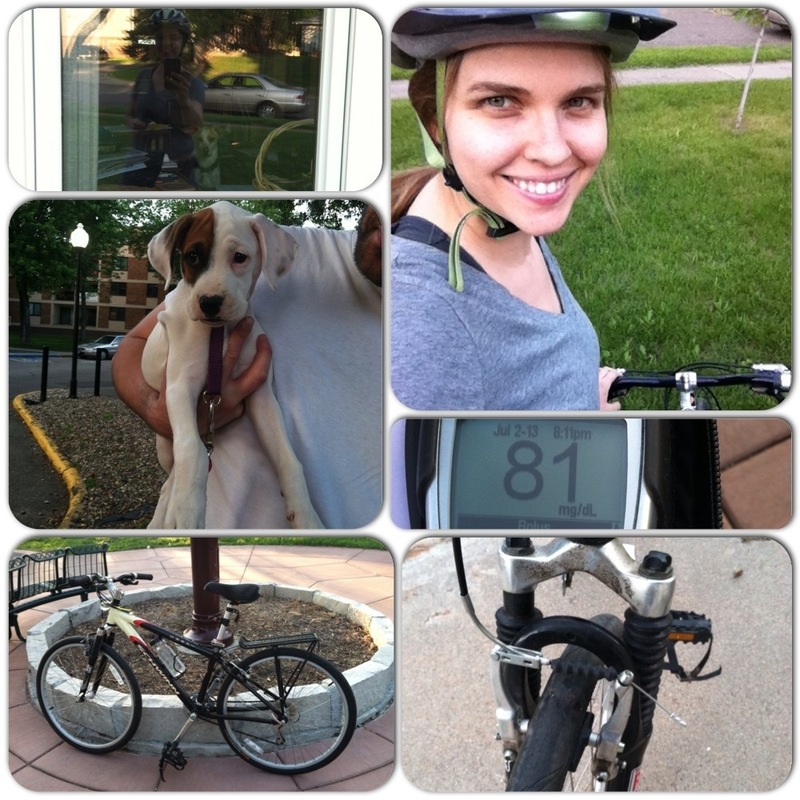 I ate a banana and took a break before pedaling again getting up to 107. I am now at 137. Perfect! 5. Just me before the ride. How do we see ourselves: trapped or free?